Who were the Romans? Such a simple question but how many people could actually give you a concise answer? Where did the Romans originate? When did the Emperors come into power? How did the Romans acquire their massive Roman Empire? The content of this article provides interesting history, facts and information about life in Ancient Rome and provides a simple answer to the question "Who were the Romans?". Who were the Romans? Where did they originate? Ancient Italy was separated, on the north, by the Alps, from Germany. It was bounded by the Adriatic Sea, by a part of the Mediterranean and on the south, by the strait of Messina. The south of Italy, was peopled by a colony from Greece. The middle of Italy contained several states or confederacies, under the denominations of Etrurians, Samnites, Latins, Volsci, Campanians and Sabines. The north was peopled by a race of Gauls. Romulus and Remus the first rulers of the Romans originated from ancient city of Latium, Italy, in the Alban Hills about 12 miles southeast of Rome which was under the dominion of the Etrurians. Romulus is commonly reported to have founded the city of Rome which was situated on the river Tiber in B. C. 753. Rome was built on seven hills. The seven hills of Rome were called the Palatine, Capitoline, Quirinal, Esquiline, Viminal, Caelian, and Aventine. Rome was at first only a small fortification; under the kings and the republic, it greatly increased in size; but it could hardly be called magnificent before the time of the first Emperor - Augustus Cæsar. The greatest number of inhabitants in Rome was four millions; but its average population was not more than two millions. The Romans were divided into three tribes and the people were initially separated into two ranks or classes. The small ruling class of nobles were called the Patricians and the other class were called the Plebeians. Slaves were added by the people of Rome after by being taken in war, by way of punishment, or were simply born in a state of servitude. The number of slaves in Rome and through Italy, was immense and some rich individuals are said to have owned several thousand slaves. The power of the master over his slave was absolute. The history of Rome is that of a city which originally had only a few miles of territory, and gradually extended its dominions at first over Italy and then over the civilized world. 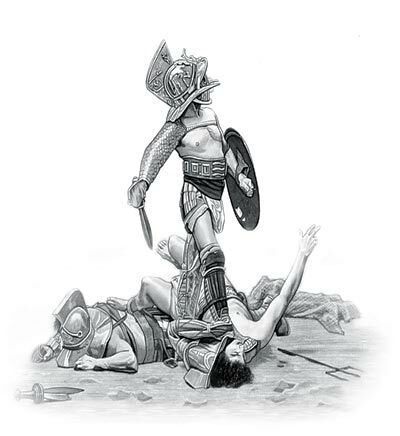 The Romans at first conquered the people of the surrounding areas. Their thirst for wealth and power increased and they conquered many other countries which became part of the Roman Empire. The capital of the Rome Empire was in in Rome and by 395AD every single country surrounding the Mediterranean Sea was ruled by the Romans. 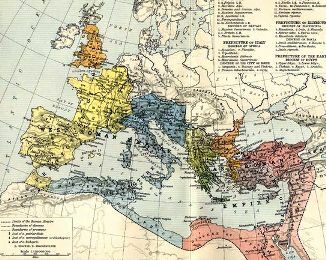 The Romans conquered so many countries that eventually the Empire was split into two - the Western Empire and the Eastern Empire, each of which had its own Emperor. The last Western Roman Emperor, Romulus Augustulus, resigned in 476 A.D but the Eastern Roman Empire would last another 1,000 years as the Byzantine Empire controlling the countries in the east. The content of this Who were the Romans? category on life in Ancient Rome provides free educational details, facts and information for reference and research for schools, colleges and homework. Refer to the Colosseum Sitemap for a comprehensive search on interesting different categories containing the history, facts and information about Ancient Rome.